Six Flags Over Texas, the Thrill Capital of Texas, in partnership with Warner Bros. Consumer Products and DC Entertainment, announces the debut of JUSTICE LEAGUE: Battle for Metropolis. Named by USA Today as one of the most anticipated new attractions of the year, JUSTICE LEAGUE: Battle for Metropolis promises to take the industry by storm and have park guests clamoring for the chance to team up with the world’s most famous Super Heroes in a multi-sensory, first-of-its-kind dark ride adventure. This next generation of interactive thrills offers guests the ultimate dark ride adventure when they team up with SUPERMAN, BATMAN, WONDER WOMAN, GREEN LANTERN and THE FLASH after accepting the challenge to outwit Lex Luthor and The Joker’s plans to destroy the city of Metropolis. As JUSTICE LEAGUE Reserve Team members, riders travel in sleek six-passenger custom designed, motion-based vehicles and engage in a full-sensory battle, complete with 4D effects of fire, cannon blasts, and explosions all while experiencing hairpin, 360-degree turns and the world’s first-ever virtual loop on a dark ride. 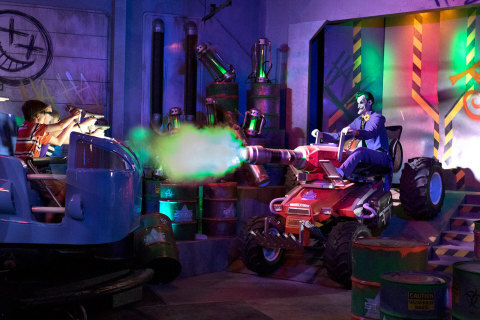 Riders use interactive laser blasters and attempt to extinguish the 600 virtual and tangible targets featured throughout the attraction, including a life-like villain animatronic, robotic henchmen, helicopters, a hologram and an interactive fog screen. The realistic features take the ride gaming experience to an unprecedented level. Six Flags, the largest regional theme park company in the world, collaborated with the most innovative minds in the industry to bring this thrilling attraction to life. Sally Corporation, the industry leader in dark rides, designed the complete experience including story development, scenery and life-like animatronics that guests encounter throughout the ride. Pure Imagination, the gurus of Computer Generated Imagery, created the 3D graphics and film. Alterface, renowned for their work in site-based interactive game play, headed up the robust gaming elements and Oceaneering designed the first-of-its-kind, fully programmable, multi-degree-of-freedom vehicles that transport guests through all the exciting twists and turns. Six Flags Gold Season Pass Holders get an exclusive sneak peek of the new ride on May 21 and all Season Pass Holders get advanced exclusive ride time on May 22. Six Flags Over Texas is now open for daily operation through August 23. Visit sixflags.com/overtexas for more information, including park operating hours. JUSTICE LEAGUE and all related characters and elements are trademarks of and (c) DC Comics.